Before the summer of 1991, when I was just 9, I thought I knew everything about baseball – and, if not everything about baseball, everything about the Baltimore Orioles. I grew up going to games with my family. I also tagged along with my father and some of his college friends, one of which played “fantasy baseball.” This particular friend was astounded at my ability to recall statistics, trades, etc. What changed that summer? I rode in a car driven by my father to Cooperstown, New York. We had an old Volkswagen Rabbit (I think) without A/C. I had purchased Pocket Full of Kryptonite (holy crap what a video) before the trip and we listened to it on repeat the entire way – my father must have hated the Spin Doctors. Anyway, the whole city is amazing, baseball card stores, memorabilia abounds – and that doesn’t include the awesome history-rich spectacle that is the Hall of Fame. On this trip, I opened a 1989 Upper Deck pack and received a Ken Griffey, Jr. card. Magic. Getting to actually go into the Hall was a special thrill. I got my picture taken in-between the plaques of Brooks Robinson and Frank Robinson. Then we wandered around and I saw Hoyt Wilhelm. 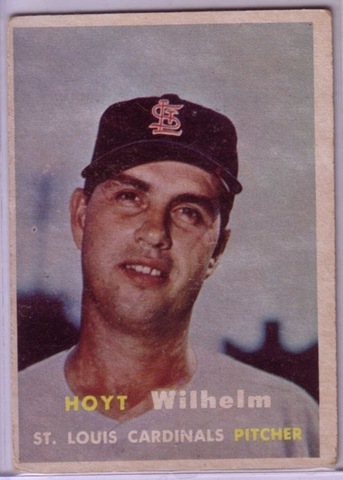 I had no freaking clue who Hoyt Wilhelm was. 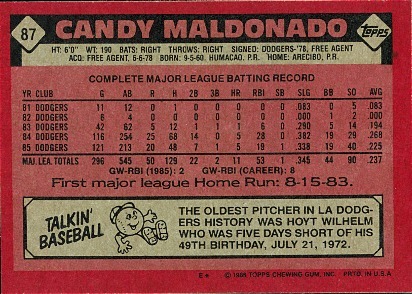 I had never studied my Candy Maldonado cards apparently (probably because I hated Maldonado even though I sort of liked the Blue Jays teams from the early 90s…Maldonado always seemed to make errors and lollygag. But, I’ve already written about Maldonado so there’s no reason to dwell). Wilhelm, who pitched as a 48-year-old, had a career that spanned 21 seasons and 2,254 innings and he racked up a bunch of records on the way. Wilhelm appeared in the fifth most games in history by a pitcher: 1,070, which trails only Dennis Eckersley, Mike Stanton, John Franco and Jesse Orosco – modern day relievers. He also owns the 30th best ERA (2.52) by a pitcher with at least 1,500 IPs. He owns the most career victories in relief: 124 – a record not likely to ever be broken. He also pitched the most innings in relief in MLB history: 1,871. And that knuckleball was devastating, resulting in the eighth lowest opposing batting average – people hit just .216 off him – a mark better than Randy Johnson. Hell his knuckleball was so good, the Baltimore Orioles created a bigger mitt so catchers could handle it. And, really, it wouldn’t be until he joined the Orioles that his career would take off. He spent eight seasons with the New York Giants, St. Louis, and Cleveland, until the Indians gave up on him and Baltimore claimed him off waivers. He pitched for parts of five years for the Orioles, amassing 14.7 wins above replacement player, a 2.42 ERA and 2.28 K:BB walk rate. 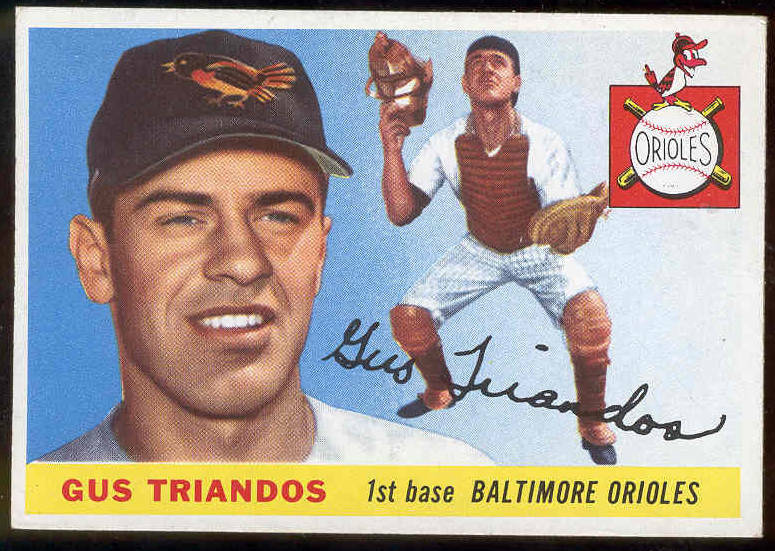 Eventually he would be part of a trade that brought the Orioles Luis Apiricio. Still, Wilhelm is probably most remembered for September 20, 1958 when he threw a no-hitter against the hated Yankees and Mr. Perfect, Don Larsen. The Yankees wouldn’t be no-hit for another 45 years. Then, the following year, on August 6, 1959, Wilhelm almost pitched a no-hitter in relief. 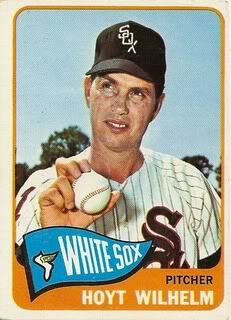 Entering the game at the start of the ninth inning, Wilhelm held the White Sox hitless for 8⅔ innings before finally surrendering a hit in the 17th. Wilhelm also fought in Europe during World War II and was wounded in the Battle of the Bulge. He received the Purple Heart. 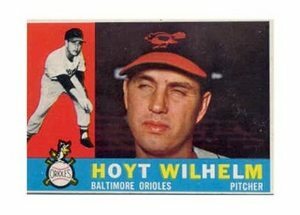 I’ve found my way to a number of Hoyt Wilhelm cards over the years (all pictured here). I realize he’s a borderline Hall of Famer, at best, but his career remains terribly fascinating to this day. I stumbled upon his life much the same way I stumbled onto this topic – just cruising through baseball history looking to soak up knowledge. Who knew something good could come from Candy Maldonado?